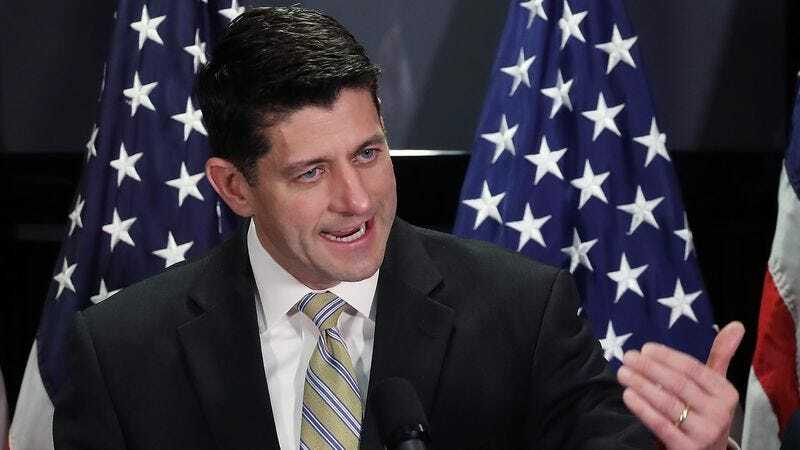 WASHINGTON—In an effort to reassure citizens ahead of a planned effort to overhaul the U.S. healthcare system, Republican congressional leaders promised Monday that Americans would still be able to keep their current medical conditions if the Affordable Care Act is repealed. “Whatever health problem you have right now, you will absolutely still be allowed to continue having it once Obamacare has been dismantled,” said House Speaker Paul Ryan, adding that the repeal of the landmark healthcare legislation would in no way prevent patients from maintaining their existing medical issues or even adding to their afflictions. “Let’s say you have lymphoma. Under our plan, you can still have lymphoma. You could even expand on that into other forms of cancer. In fact, for the vast majority of Americans, repealing Obamacare will actually increase the number of significant medical conditions available to them.” Ryan added that under the new system, millions of Americans would also see a 100 percent reduction in their health insurance premiums, copays, and coverage.